Home»Itchy Skin»What Causes Small Red Itchy Bumps on Skin? Waking up in the morning, finding out some strange things appearing on your skin can be a morning shock. Especially if you have outbreaks of red itchy bumps all over your arm or leg. It might only be a mosquito bites and it will disappear in time. But, what if it’s something else? Find out what causes small red itchy bumps on skin here. Don’t start to panic or think negatively if you find outbreaks of small red itchy bumps on your skin. What you need to do is stay calm and sort unusual things that you might do, eat, or touch for past few days. Maybe like a new flower you pick in the park, fruit you don’t normally eat, or new cosmetics you just try on. If you do had something like that, it’s likely to be an allergic reaction. Allergy is quiet easy to treat. You can ask an allergy blood test to find out specifically what kinds of allergies you have. And then you won’t experience any allergies, unless you broke your rule. That’s one of the way to know what causes small red itchy bumps on skin. This might sounds worse than allergy. But again, don’t panic and help the doctor diagnose you by sorting the things or people you encounter before it appears. Check if some of your friends and relatives you met had infectious skin disease like chicken pox and impetigo. Disease like chicken pox comes with not only itchy bumps or other skin conditions, but also symptoms other than on your skin. If you’re also experiencing fever, sore throat, headache, and cough during the outbreak, well you might want to see a doctor right away, because it maybe a chicken pox. And to be surer, look closely at the bumps. If it’s a red fluid-filled blisters, then pack your bag and go to doctor. It happens mostly on children around 12. However, that doesn’t mean adults are immune to that. 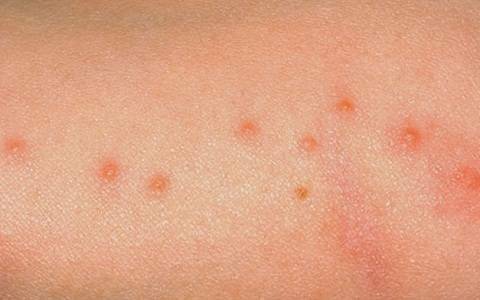 Other possible answer to small itchy red bumps on skin causes is scabies. It’s a contagious skin disease caused by a Sarcoptesscabieimite. The bumps will appear usually two to six weeks after the first infection. Prolong skin-to-skin contact with previously infected person can transmit the mite. You can’t directly see the mite living on other people’s skin since it lives under your skin, but you can recognize the rash and try to avoid having direct contact with it. If you still have doubts about what causes small red itchy bumps on skin, you better check yourself up to the dermatologist, the will run a few test and help you with your treatment.